We visited a very large antique show in Atlanta a couple of months ago. There were several dealers there who specialized in various forms of silver pieces. At least two dealers had large supplies of ice scoops and asparagus servers in various popular sterling flatware patterns. The pieces were all selling in the $40 to $50 range. On close inspection of the pieces, it appeared that they were not manufactured by the original sterling flatware companies that owned the patterns. Instead, they looked like they each had a hollow handle cut from original pattern knives to which had been attached a "custom" ice scoop or asparagus server hood. In other words, these were "made up" pieces. You might refer to earlier posts regarding made up pieces. In the right column of this blog, under "Labels", click on "Made Up". So, that set us to thinking, "What's real and what's not?" We looked at a book published by The Gorham Company in 1914 regarding their Chantilly pattern. The picture below was found in that book. Based on this picture, it looks like Gorham manufactured two basic types of Chantilly asparagus serving pieces at that time: an "asparagus fork" and an "asparagus server". The fork appears to have been made of solid sterling while the server had an attached "hood" that might have been made of sterling, silver plate or something else. 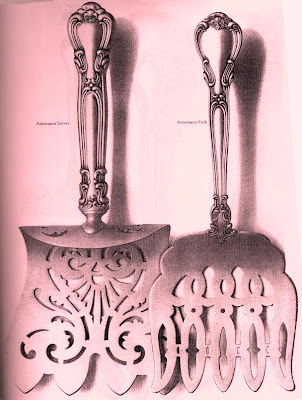 Here is a picture of "asparagus tongs" taken from the book published by The Gorham Company in 1910 regarding their Strasbourg pattern. It appears that the current market price for these pieces varies widely depending upon the construction. We reviewed sales of asparagus serving pieces that actually sold on eBay over the last couple of weeks. Prices ranged from about $40.00 for an asparagus server with a non-sterling hood to about $560.00 for a solid sterling Chantilly asparagus fork and about $650.00 for Strasbourg asparagus tongs (the tongs looked different from the picture above). We're not saying that you should not buy a "made up" piece. If it meets your needs and you like it and it's reasonably priced, buy it. What we are saying is that you should understand precisely what you are buying.